It all started on twitter (again). This time it happened while I was drinking a Ballast Point Big Eye IPA (see the video here) and waxing lyrical about the Centennial hop. Then a tweet popped up from Barry, of The Bitten Bullet fame, along the lines of ‘If you like Centennials then you’d like my homebrew hopped with Chinook and Centennial’. Fast-forward three weeks and there I was drinking it with Pete (that’s where we had awesome Spag Bol with Rochefort 8, by the way). Now, I don’t have any experience with homebrew so didn’t really know what to expect. To be honest, without wishing to do any injustice to Barry, I was preparing myself for something drinkable but perhaps not comparable to the normal, commercial beers which I drink all the time. I was very wrong. We started with Spiral Galaxy H1N1, a 5.2%, 35IBU single hop pale ale. I know Barry brewed this while house-bound due to swine flu, so there was a little inherent danger in this beer (a week later and I’m showing no symptoms…). It’s golden with a tropical fruit aroma, kind of like fruit salad sweets and passion fruit. The malt was really clean and crisp, biscuity. The bitterness was good and I could’ve drunk a lot of this one. I hadn’t heard about Galaxy hops before so it was good to see it in action. Anyone know any beers which use Galaxy? Next came the Alternative Munster Altbier, a 4.6%, 38IBU Alt hopped with Northern Brewer and Hallertauer Perle. Barry tells me that it isn’t lagered, hence the ‘alternative’ in the name. I’m not a massive Alt fan, not really getting their point, but there was plenty going on in this: caramel, berries, brown bread, chocolate and an earthiness. Very nicely brewed, very clean and tasty. Then we opened the one which kicked the whole thing off: Klosteiner Pale Ale, 5.9%, 40IBU and hopped with Chinooks and Centennials (that just reads like beer erotica to me). Now this really was something special. Deep orange-gold in colour with a great orangey, perfumed, fruity nose which went straight through into the taste, along with a caramel sweetness, giving loads of Centennial bite and a whole spectrum of oranges and citrus. Pfwoar! I wanted a lot more of this one but apparently I had the last bottle. Please brew it again! Finally came the Bitten Bullet Barley Wine, a 10.5% beast, hopped with Cascades, Chinooks and Centennials with an IBU of 106. Wowza! We had this with an incredible oozing piece of gorgonzola and it was a real winner. The beer is big and brooding, as you’d expect. It has a huge hoppy aroma, like Sierra Nevada’s Bigfoot, then beneath that it’s chocolate and dried and stone fruit. It’s earthy and unforgiving, there’s loads of burnt citrus, over-done brown bread toast and then more banging hops. Only 22 were made and I think Barry has the intention of aging them for quite a while, allowing the hops to mellow right down. He also sent a very rare version of this aged over oak chips with the specific instruction of not touching it until Christmas, when it’ll be a year old. I look forward to it. Also in the box he shipped were a few German beers and a beer mustard. Herren Pils was pretty much my perfect pilsner, light and fruity and so drinkable (I had just spent five hours walking around Ikea though, so even this would've tasted like heaven). Boltens Ur-Alt was malty, nutty, bready and slightly roasty, although again, Alt’s not really my thing. And a Fassla Zwergla, a Bamberg Dunkel (Bamberg Dunkel sounds like a character from a Vonnegut novel…) which had a really nice simplicity to it with apples, toffee and toasted brown bread. I like this homebrew thing. There's definitely something in it... All my expectations were blown away and I was massively impressed. These weren’t just good beers, these were excellently brewed beers that I’d want to drink again and again. If you would have placed these in front of me and asked my honest opinion, without any prior knowledge of them, I would’ve guessed a well established and quality commercial brewery. Barry, you should be very proud of those beers, now hurry up, get back to brewing and ship me some more over! I'm enjoying the Galaxy one, partly because of that amazingly fruity thing the galaxy hops bring, and partly because of the look on German faces when they try it and realise a beer following the Rheinheitsgebot can have such flavours. And they like it! The alt is a work in progress, let's say. A few teaks and some temperature control would make it more authentic, but screw authentic :oP Oh, and fans of Stiff Little Fingers might get the other Irish reference. Yep, those sound like Barry's beers all right. I learned to brew, if not at his feet, at least in his kitchen. And that really is what homebrew tastes like. Thanks for allocating some space to exploding the myth. Galaxy hops rule because they are Australian. They are the signature hop of Stone and Wood draught ale. Barry, it's my pleasure. Any time you want more feedback you know where I am :) Really looking forward to the oaked BBB! 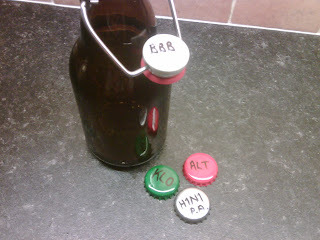 Beer Nut, who knew that homebrew tasted like real beer, eh?! I can vouch for Barry's work too, having enjoyed numerous bottles. The great things is, just about anyone can brew beer of excellent quality at home, you just have to put some time aside to learn and do it. When can we expect your first batch Mark? Nice to see you trying out the hombrew. There are lots of us out there brewing beers that we feel truly stand up to commercial brews, and simply lack the resources to get them out there. nice work.